Peter started Aikido with the Aikikai system in Australia, before travelling to Japan to live and train at Hombu Dojo. Whilst in Japan Peter moved away from Hombu, settling on a small country dojo in Chiba prefecture, with a Sensei that was focused on the study of Aikido as a martial way, and trained and taught accordingly. After two and a half years Peter returned to Australia, and on the recommendation of his Japanese Sensei, he went in search of a teacher to help him learn to relax. This two year search resulted in Peter training in various styles, and grading in those styles. As a result Peter has Dan grades in three styles of Aikido, and has also completed multiple grades in two other styles. In 2002 Peter was able to attend the first foreign seminar of the newly formed Aikido Yuishinkai, and its founder, Master Koretoshi Maruyama Sensei. 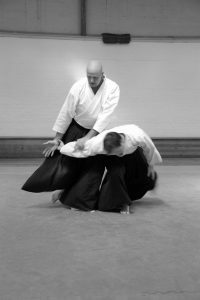 After receiving ukemi for Sensei, Peter realised he had found the teacher his Japanese Sensei had instructed him to find, and committed himself to study Aikido as taught by master Maruyama. Peter was lucky enough to find himself as Maruyama Sensei’s main Uke at seminars, and would travel with him to act as Uke whenever life permitted. In 2004 Peter established his dojo in Hobart Tasmania, and has been teaching from this base ever since. Peters hero is Tessu Yamaoka, the Japanese sword master and Zen calligrapher, and Peter places great emphasis on his philosophy both on the mat and in life. 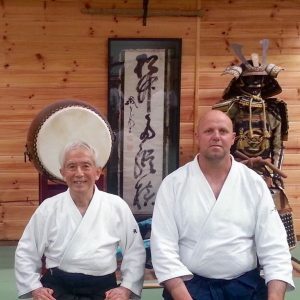 In 2014, due to his technical excellence Master Maruyama appointed Peter to the position of Chief instructor of Australia, and in 2019 appointed him to the position of International Chief Instructor. Peter has taught seminars and classes in Europe, Australasia, and Japan. After visiting Sensei in Tokyo in 2016 Peter made a pact with Sensei to promise to promote and teach the true Aikido and Philosophy of the founder of its Morihei Ueshiba O’Sensei. That is training to forge the spirit (Tanren), and that Aikido is Misogi Harai, a purification of the spirit, as represented by Ame no Murakumo Kuki Samuhara Ryuo no Kami, the magnificent Dragon Deity that protects and nurtures all things in Nature. Peter lives at his base in Tasmania with his wife and three children, from where he travels to teach and spread the Aikido of Maruyama Sensei.